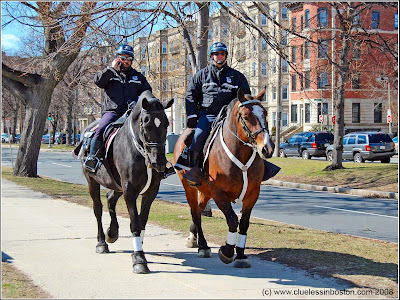 A couple of Boston's finest patrolling The Fenway area of Boston on horseback. I wonder if cellphones have taken over from police radios? Pony Tails. :-) Hope you enjoy the weekend and find sunny skies again soon! Those horses are nice to see. Nice shoes on them too. Two great photos. 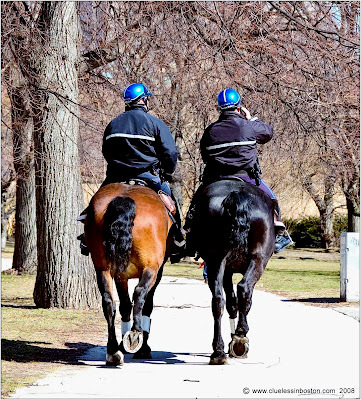 Those cops look as burly as the horses! And the guy on the phone looks like Pavarotti, lol. It must be so good to work with horses! These policemen are very lucky! lol...Pony Tails! Both great photos, however you look, back or front...they're great! I put the second photo of this post at the right column of my blog, ok?? It's really beautiful! I like the second picture. I LOVE working Police horses!!! Yes, the cell phone is at least an adjunct of Police communication now.